White metal diorama accessories. AB Figures is better known for its figures. The company was temporarily out of business during 2013-2016, but is now up and running again, being part of Eureka Miniatures of Australia. ACS1 3 dead cows Just the thing to liven up that Normandy battle field scene. WWII/1 Road signs, Northern France - sheet 1 Printed paper signs. WWII/2 Road signs, Northern France - sheet 2 Printed paper signs. WWII/3 German road signs and unit markers Printed paper signs. WWII/4 Road signs - Allied and German Printed paper signs. WWII/6 Advertising and shop signs - Northern Europe Printed paper signs. RAC8 Drivers for softskin vehicles Drivers in helmets for trucks, etc. 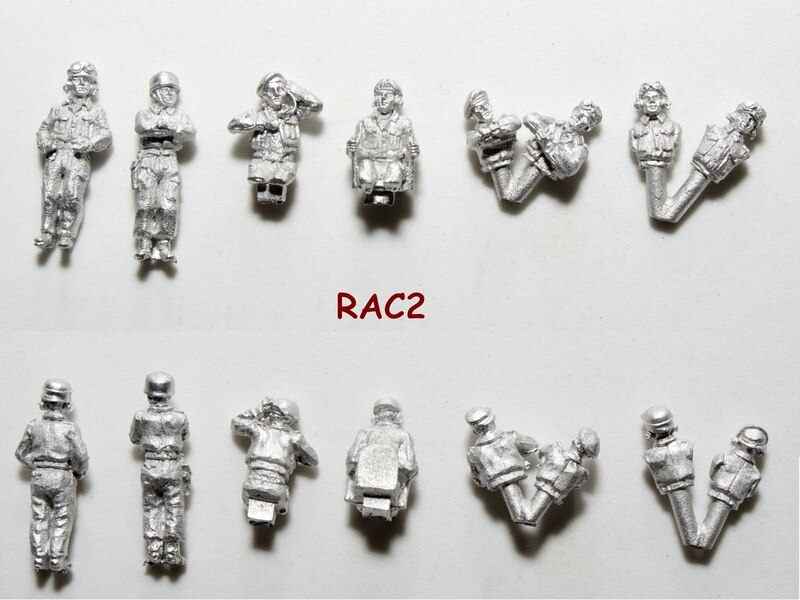 RAC11 Universal carrier crew 4 figures and storage. RAC12 FOO and RAF liason office. Figures for a Humber or Daimler scout car. 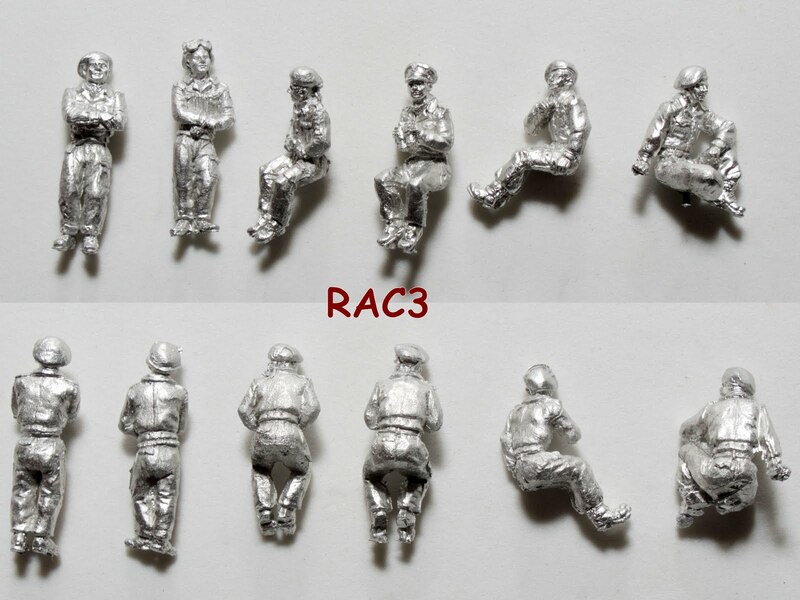 RAC13 6 useful Tommies in tin hats Standing and sitting figures for dioramas. RAC15 AFV crew bailing out. 6 figures of crewmen exiting from hatches, jumping and crouching. WDF1 Royal Tank Regt - set1 6 man crew set in sitting, standing and hatch positions for Western Desert period. WDF3 Dingo crews 2 x 2 man crews of half figures. BLA1 Infantry section, marching 10 man infantry section in battle gear. Somewhat larger than the crew figures. BLA8 Infantry section - tank and vehicle riders - set1 10 figures, assorted kneeling sitting and standing to use as tank riders. Sitting and kneeling figures tend to be larger scale-wise than standing figures or the crew figures listed above. 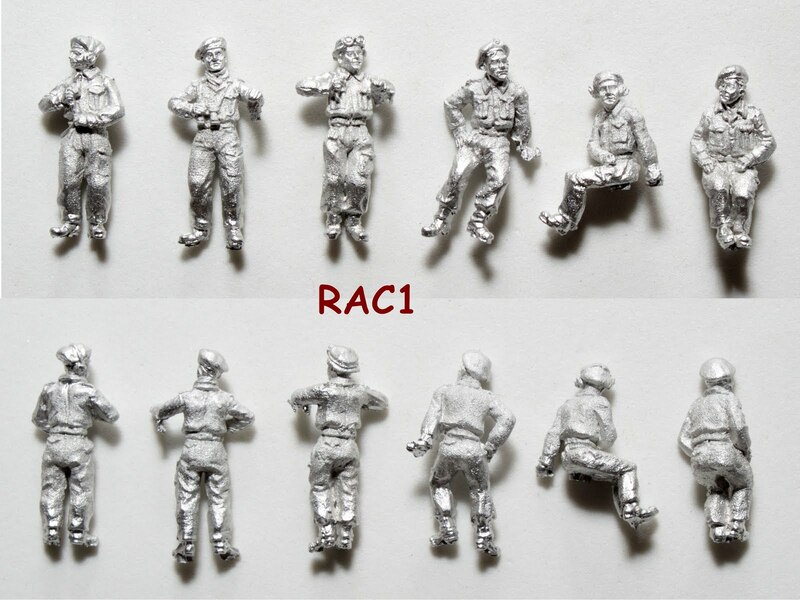 BLA9 Infantry section - tank and vehicle riders - set2 10 figures, assorted kneeling sitting and standing to use as tank riders. Sitting and kneeling figures tend to be larger scale-wise than standing figures or the crew figures listed above. BLA10 Seated infantry for trucks, etc. - armed 8 sitting figures for placing in softskins. Figures are armed and posed as if in battle zone. BLA11 Seated infantry for trucks, etc. - relaxed 8 sitting figures for placing in softskins. Figures are unarmed and posed as if in rear echelon. BLA12 Company/ platoon officers 5 figure set of officers in action and other poses in helmets and battledress. BLA13 Radio and field telephone operators 5 figure set in action and other poses. BLA14 PIAT teams moving and firing 4 figure set. BLA15 2" mortar teams moving and firing. 4 figure set. BLA16 6 pdr anti-tank crew 4 figures & ammo boxes. BLA17 3" mortar teams 2 tubes & 10 figures. BLA18 Sappers/ pioneers 6 figure set. BLA19 Casualties - set1 5 figures. BLA23 6 officers Battalion and staff officers in field hats and other headgear. BLA24 Platoon HQ in slit trenchess 11 man set. BLA25 Vickers MMG teams & accessories 11 piece set. 2 MMG's and bases, plus 3 man crews for each. BLA26 4.2" mortar crew and accessories 10 pieces. BLA29 Additional Tommies in fighting poses 10 figures in mainly kneeling and prone poses. BLA30 2" mortar team and PIAT team, marching 4 Figures. BLA31 Dead Tommies 3 figures. BLA33 Kangaroo - Set 1 Crew figures and infantry passengers. BLA34 Kangaroo - Set 2 Crew figures and infantry passengers. BLA36 Regimental Aid Post 20 pieces, including Chaplain, stretcher bearer and wounded. BLA37 Tommies relaxing 10 figures. BLA38 Military Police Intelligence officer, prisoner, motorcyclist and other figures. 8 pieces in all. BLA39 Tommies eating 8 figures. BLA40 Motorcyclists and dispatch riders 12 pieces, including figures and vehicles. BLA41 Company stretcher bearers in a hurry 1 piece casting. BLA42 Batalion/ company motorcyclists 2 figures + bikes. BLA44 Armed Tommies for the rear of Jeeps, etc. 6 figures. BLA45 Commando assault section in berets and bergens with Vickers K gun 10 figures in action poses. 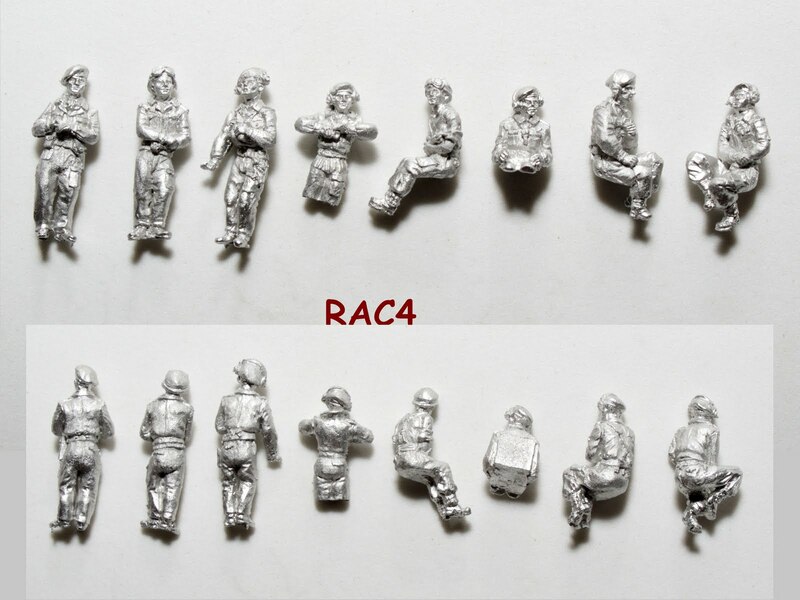 BLA46 FOO and radio operator for artillery and mortar batteries 2 figures, prone. BLA57 Battery/Troop Command Group: staff, radio "arty" board, etc. BAF1 Airborne Infantry section moving up/walking 10 pieces. Airborne Infantry section advancing/running 10 pieces. Airborne Infantry section kneeling/prone 10 pieces. Airborne 2 inch mortar and PIAT teams 6 pieces. Airborne Vickers machine-gun team 3 pieces. Airborne 3 inch mortar & crew 7 pieces. Airborne 6 pdr gun crew 4 pieces. Airborne 75 mm Howitzer crew 4 pieces. Airborne DZ/LZ party 12 pieces. BAF12 Airborne trolley + "crew"
BAF16 Airborne Jeep drivers & crews (enough for 3 jeeps) 12 pieces. PZ3 Panzertruppen 1940/43 in side cap (half figures) 6 figures for posing in tank hatches. PZ8 Kubelwagen crew in caps 4 sitting figures. PZ9 Kubelwagen crew in helmets Same figures as PZ8, but in alternate headgear. PZ10 Staff car set 4 figure set - 2 officers and two drivers/ orderlies. PZ11 Germans in greatcoats for Sdkfz7 7 man crew set in sitting positions. PZ13 Panzerjäger crew 6 man crew set for German open top vehicles, loading shells or standing. PZ14 AFV Crew bailing out 6 man crew set for German tanks, climbing out of tank, jumping to ground, kneeling, etc. PZ16 SS panzer crews 6 man crew set for German tanks and SPG's. Hatch half-figures in late war uniform. DAK2 Afrika Korps Crew - set 2 6 figures. DAK3 Pz. grenadier crew for Sdkfz 251 halftrack 8 figures in standing and sitting positions. DAK4 Luftwaffe crew for 88mm Flak gun. 12 figures in tropical uniform. WH1 Wehrmacht infantry section, marching - casual poses 10 figures in route march poses in battle order. Essentially a battle section of late war German troops. Figures are noticeably larger than crew figures. WH2 Infantry section - advancing/ skirmishing 10 figures. LMG pair cast on 1 base kneeling, firing. The others upright. WH3 Infantry section - prone Usual 10 figures. WH4 Infantry section in camouflage 10 Figures advancing, kneeling or prone in ponchos or with leaves and foliage in equipment. WH5 Infantry section in foxholes 10 figures. WH7 PAK 40 crew 4 kneeling figures. WH8 8 cm mortar crew 2 tubes with crew and accessories. WH9 Officers/ staff pesonnel 6 standing figures. WH10 Senior NCO's and officers 6 figures. 2 in action positions and 4 standing. WH11 Dead Germans 6 figures. WH12 Seated infantry for trucks and halftracks 8 figures. From experience, these are a little smaller than most of the AB figures and are an excellent fit for Hasegawa Hamomags. WH13 Panzer Grenadiers for Sdkfz 251 9 figures. 2 machine gunners and other standing figures. Could be combined with the previous set to make 2 Hanomag crews. WH14 Radio operators and field telephones 7 pieces. WH15 German infantry tank riders - set 1 8 figures. 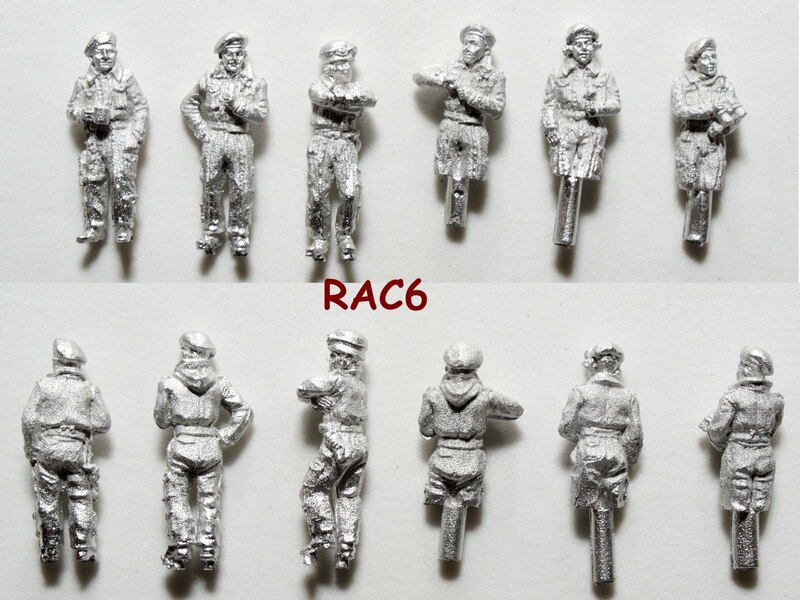 WH16 German infantry tank riders - set 2 8 figures. WH20 Crew carrying tripod mounted MG42 5 pieces. WH21 Infantry section - advancing cautiously 10 figures. Medics rescuing & treating wounded 10 figures. SS1 SS Infantry section, advancing 10 figures in cammo smock and helmet covers. SS2 SS infantry section in defence 10 prone and kneeling figures. US1 US tank crew - set 1 6 figure set, standing figures plus busts and half figures. US2 US tank crew - set 2 6 figure set. US3 US tank crew in winter clothing - set 3 6 figure set, sitting and standing figures. GI1 Infantry squad walking 12 figures. GI2 Infantry squad advancing 12 figures. GI3 Infantry squad, kneeling/ prone. 12 figures. GI4 Officers and radio operators 6 figures. GI5 .30 cal. mg team, firing. 2 figures. GI6 Dead infantry 6 figures. .30 cal. crew walking 2 figures. Bazooka team kneeling & firing 2 figures. Bazooka men - 1 prone firing; 1 advancing 2 figures. 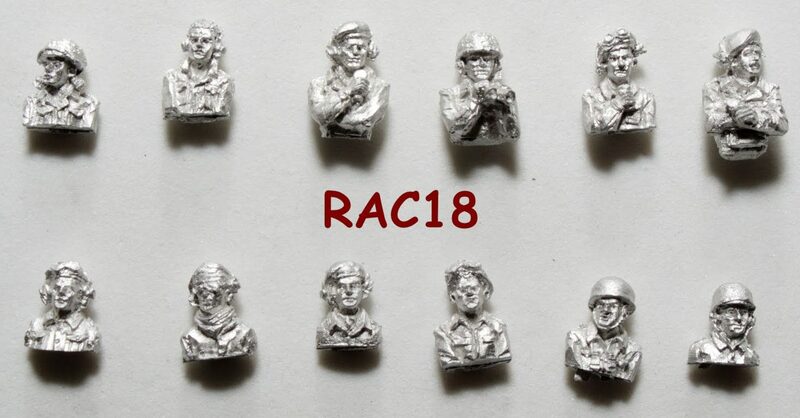 GI16 FOO + radio operator for artillery & mortar batteries 2 figures. Mine clearing group 6 figures. GI18 Additional GI squad 12 figures. 57mm A/T gun crew 4 figures. 3 inch A/T gun crew and accessories 4 figures. SOV1 Soviet tank crew, 1941-43 6 figures & half-figures in standing, sitting and hatch poses, in early war uniforms. SOV2 Soviet tank crew, 1943-45 6 figures & half-figures in standing, sitting and hatch poses, in late war uniforms. SOV3 Soviet tank crew in winter dress 6 figure set. 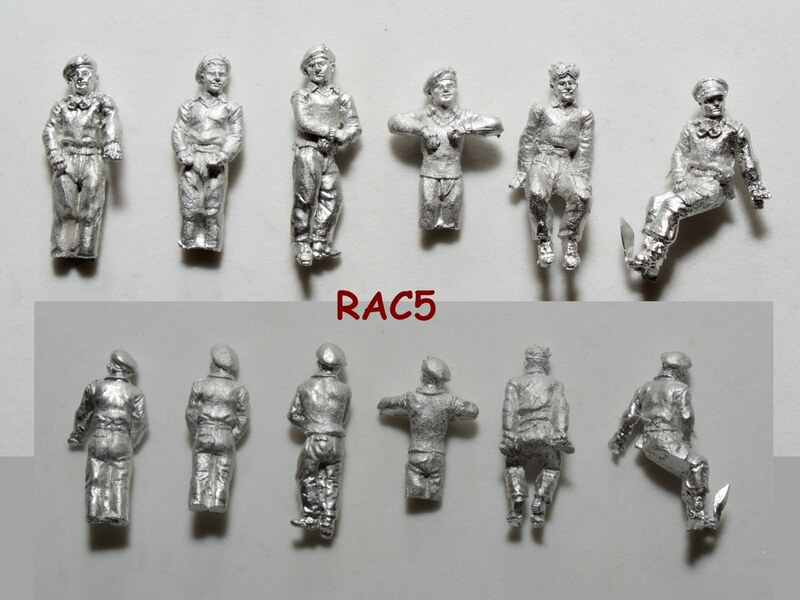 SOV4 Soviet tank crew, seated variants 8 figures. SOV6 GAZ jeep crew 3 seated figures, including 1 officer, 1 driver and 1 sub-machine gunner. SOV7 Infantry tank riders 10 figures in seated and kneeling poses. FR1 1940 French tank crew 6 figure set.